TREIRB JL Junior Lecturers Results with Marks 2019 Released at treirb.telangana.gov.in: TREIRB JL Junior Lecturer Posts Hall tickets 2018, TREIRB JL Junior Lecturer Posts Exam Date 2018, TREIRB JL Junior Lecturers Recruitment Hall tickets 2018, TREIRB JL Junior Lecturers Recruitment Exam date 2018, Important Instructions to Junior Lecturers Candidates, Telangana Residential Recruitment Junior Lecturers Hall tickets, Telangana Residential Recruitment Junior Lecturers Exam Dates. TREIRB JL Junior Lecturer Posts 2018 Hall tickets, Exam date at treirb.telangana.gov.in. 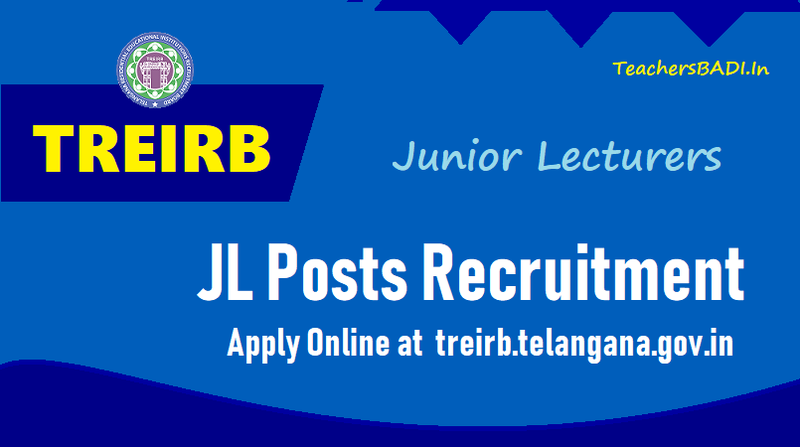 TREIRB RJC JL Junior Lecturer Posts 2018 Recruitment, Apply online at https://treirb.telangana.gov.in: TREIRB to be fill JL Junior College Lecturer Posts in Residential Educational Institutions Societies through Direct Recruitment 2018. Telangana Residential Recruitment Board has given the JL Junior Lecturer Posts 2018 recruitment notification to fill the Junior Lecturer JL Posts in #TREIS, TSWREIS, TTWREIS, MJP TBCWREIS and TMREIS Residential Instituitions through Direct Recruitment. TREIRB DL Degree Lecturers Results with Marks 2019 Released at treirb.telangana.gov.in: TREIRB has released the JL Posts Recruitment Exam Results with Marks and Final Answer keys on March 16, 2019. Results would be enabled on March 19, 2019. The candidates who have appeared for the Degree Lecturer Posts Recruitment examination can download their Results with Marks by log in to the website. The TREIRB is conducting this examination to recruit Junior Lecturer (JL) posts across the state. The recruitment will be done on the basis of the written test results and interview rounds. How to Check the JL Results 2019? The Telangana Residential Educational Institutions Recruitment Board will hold the recruitment test for 281 posts Junior Lecturer (JL) and 466 posts of Degree Lecturer (DL) in Telangana Residential Educational Institutions Societies from February 14, 2019. The recruitment to DL posts will commence from February 14 whereas for JL posts, pedagogy paper will be held on February 16. A common exam in general studies for both DL and JL will be held on February 17 while subject wise recruitment test to JL posts will commence from February 18. Office of the Chairman Telangana Residential Educational Institutions Recruitment Board Government of Telangana Dated: 17.12.2018. JL and DL Examination Schedule The TREI-RB has issued Notification No.3 and No.4, dated: 31.07.2018 and 02.08.2018, respectively for General Recruitment for 281 posts of Junior Lecturers (JL) and 466 Posts of Degree Lecturers (DL) in Telangana Residential Educational Institutions Societies. TREIRB JL Junior Lecturers Written Exam Schedule (JL Exam dates) 2019 released for General Recruitment for 281 posts of Junior Lecturers (JL) in Telangana Residential Educational Institutions Societies. The following is the schedule for the JL and DL written examination. TREIRB JL Junior Lecturer Posts 2018 Hall tickets: Hall tickets would be enabled one week before the examination. The candidates who have registered for the Junior Lecturer Pposts Recruitment examination can download the hall ticket by log in to the website. The TREIRB is conducting this examination to recruit Junior Lecturer (JL) posts across the state. The recruitment will be done on the basis of the written test results and interview rounds. How to download the JL hall ticket 2018? TREIRB JL Junior Lecturer Posts Recruitment notification released for fill up the below mentioned posts in TS Residential Institutions through Direct Recruitment - Telangana Gurukulam Recruitment Board JL Junior Lecturer Posts in TREIS Instituitions. Applications to be invited Online from qualified candidates through the proforma application to be made available on Board’s TREI-RB WEBSITE (www.treirb.telangana.gov.in) to the post of Junior Lecturers in Residential Educational Institutions Societies. So, Telangana Residential Educational Institutions Recruitment Board (TREI-RB), Hyderabad would invite applications for the post of Junior Lecturers in Residential Educational Institutions Societies. A post Graduate Degree in the subject concerned (or its equivalent) (Annexure-A) with at least 50% marks in aggregate from a University recognized by the UGC. Minimum 18 years & Maximum 44* years. The age is reckoned as on 01/07/2018. (Rule- 12(1) (a) (v) of State and Subordinate Service Rules). *As per G.O. Ms. No. 329, GA(Ser.A) Dept., Dt. 27/07/2015 read with G.O. Ms. No. 264, GA(Ser.A) Dept.,Dated: 26-07-2016, and G.O.Ms.No.190, GA (Ser.A) Dept, dt:08.08.2017, the upper age limit is raised up to 10 years. N.B. : 1) No person shall be eligible if he/she is less than 18 years of age. Note: BCs, SCs and STs belonging to other States are not entitled for any fee concession and they are not entitled for any kind of reservation. The Fee mentioned above is to be paid online duly following online instructions displayed in the Board Website. The fee once remitted shall not be refunded or adjusted under any circumstances. Failure to pay the application processing fee and examination fee will entail total rejection of application. TREIRB Telangana Recruitment 2018: Apply for junior college lecturer posts: The online application process for approximately 281 posts of Jr college lecturers in Telangana Residential Educational Institutions societies began on August 09. Candidates can register by visiting the official website of Telangana Residential Educational Institutions Recruitment Board (TREIRB) at treirb.telangana.gov.in. The last date to submit the application is September 08, 2018. The examination schedule will be displayed later on the website. The hall ticket can be downloaded from the official website seven days before the commencement of exam. Note: Read the notification carefully to know about eligibility and other details before applying. ii. Last date for submission of ONLINE applications Dt: 15.09.2018.